DON O'BRIEN WORKS his last day at The Herald-Whig this week. I hired him nearly 20 years ago when I was the sports editor at the paper. When I went over to the news side, Don took over as sports editor. And when I left the paper four years ago, Don took my job as crime and courts reporter - sports guys make good crime reporters. 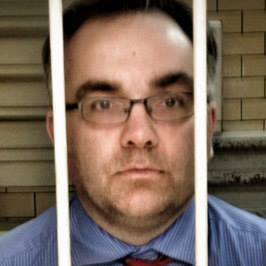 Last year was a busy one for high-profile murder trials and DOB did a fantastic job, the only media guy who completely got it and was on the inside. Don's wife, Stacy, took a job in Collinsville a while back, so the move was inevitable. Don landed a job at the Belleville paper, and they are lucky to have him. The Whig has big shoes to fill. The first story I made DOB do was about a horse. It was a frigid January morning, and I don't think he ever completely thawed out or forgave me. It was a pretty good story, from what I barely remember. Don didn't have it easy in Quincy - he's from Galesburg, Quincy's huge basketball rival, and he took a lot of grief from people. I put him on the Quincy High School basketball beat right away and instead of backing away from the few but loud haters, DOB actually encouraged feedback and wasn't afraid to put them in their place. "It doesn't MATTER what your name is!" he'd say. Amen. Then came the infamous day he got to play Augusta National after he covered the Masters for the paper. Perhaps you've heard about his birdie on No. 15. No? Then you are dead. DOB likes to talk smack. The best times were at his house when we'd watch the WWE pay per views. Of course he got the WWE network, so we made annual pilgrimages to watch WrestleMania, Summer Slam, Survivor Series, etc. There's no way I can cruise past his house off of Harrison and not feel a twinge of sadness - we laughed our butts off and had great times. His oldest son is a senior at QHS and finishing out the year here, so I'm sure he'll be back and around for the next little bit. But a big chapter in Quincy and at the paper is coming to a close. Best of luck, Don. Quincy is better off for having you for 20 years, and worse off for you leaving.